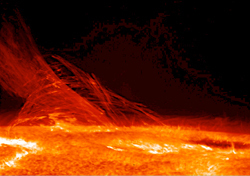 The 8th European Space Weather Week conference will take place in Namurs, Belgium from November 28 to December 2 ,2011. The conference venue is the old stock exchange of the Walloon capital, transformed into a convention center. The annual event is sponsored by the European Space Agency. This year, the local organizer is the Solar-Terrestrial Center of Excellence (STCE). Register online at the website below. Early registration ends October 22. For program information, contact co-chair Alexi Glover, ESA, at the email address below.